Vermont health officials are reporting two coyotes in two different towns have tested positive for rabies since the beginning of the month, prompting officials to advise the public to take precautions. The first coyote was collected in Salisbury after it attacked two people. Tests at the Health Department Laboratory on April 2 determined it was rabid. The second coyote was found in New Haven following reports of aggressive behavior. It tested positive for rabies on April 12. Coyotes can live in all habitats in Vermont, including suburban areas. 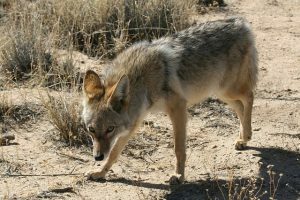 It is possible that additional coyotes in the area, and other wildlife vulnerable to rabies – such as racoons and skunks, could also be sick and capable of spreading the disease to humans or other animals. State health and fish and wildlife officials are urging residents near Salisbury and New Haven – and all Vermonters – to take precautions to stay safe and know what to do if they or their pets may have been exposed to rabies. Rabies among coyotes in the state is relatively rare. Among animals tested at the Health Department Laboratory since 2005, these latest incidents are the first coyotes to test positive. Officials said that by taking reasonable precautions, such as avoiding animals which are acting sick or aggressive, people can safely enjoy being outside or in the woods, and appreciate Vermont wildlife from a respectful distance. If you are bitten or scratched by an animal, wash the wound thoroughly with soap and water and contact your health care provider immediately. Follow all instructions they may give. If your pet or farm animal was exposed to a potentially rabid wild or stray animal, contact your veterinarian immediately. Make sure all family pets, including barn cats, are up to date with rabies shots. If you see a wild or stray animal acting strangely, reach out to your local Fish & Wildlife game warden through state police dispatch, report it to your town’s animal control officer, or call the Rabies Hotline (1-800-4-RABIES). Do not touch or pick up wild or stray animals – even baby animals – or try to make them into pets. Doing so can put yourself or your family at risk. You can’t tell if an animal has rabies just by looking at it.